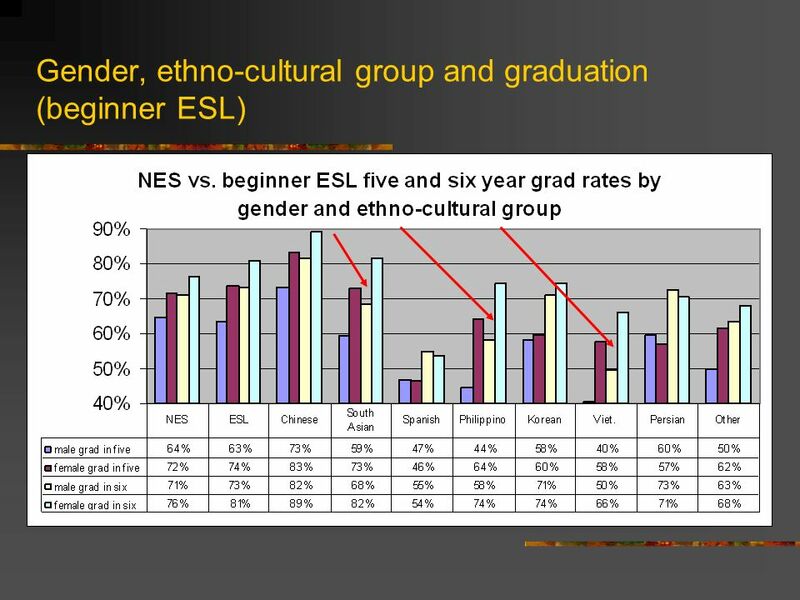 A critical examination of the academic trajectories of ESL youth Bruce Garnett, PhD BC School District 36 (Surrey) Canadian Council on Learning. 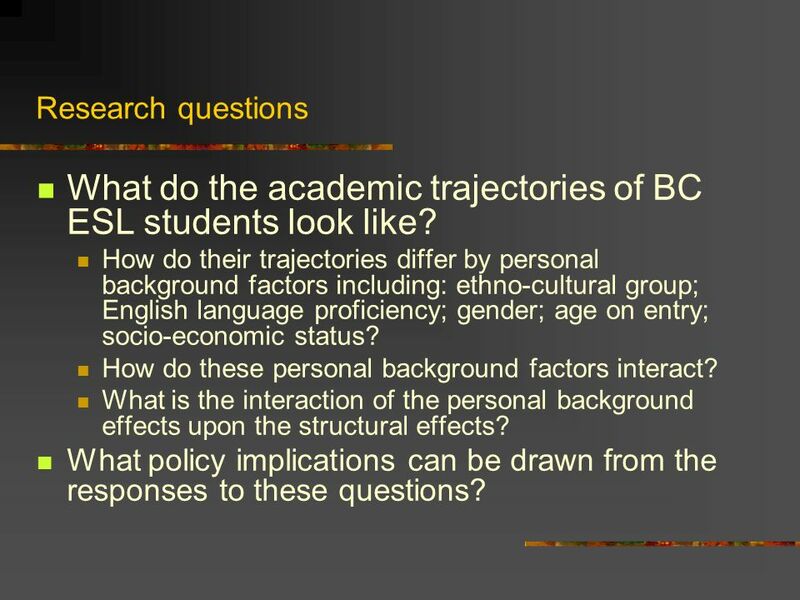 2 Research questions What do the academic trajectories of BC ESL students look like? 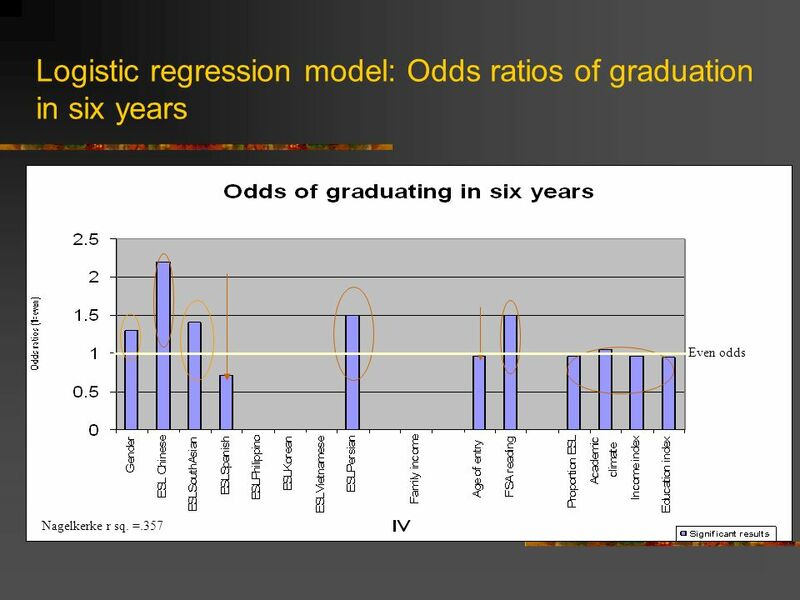 How do their trajectories differ by personal background factors including: ethno-cultural group; English language proficiency; gender; age on entry; socio-economic status? How do these personal background factors interact? What is the interaction of the personal background effects upon the structural effects? What policy implications can be drawn from the responses to these questions? 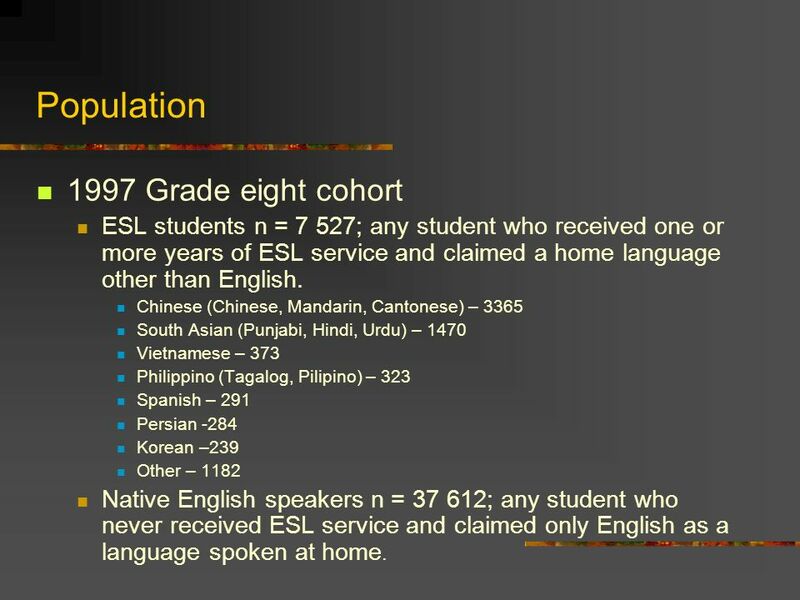 3 Population 1997 Grade eight cohort ESL students n = 7 527; any student who received one or more years of ESL service and claimed a home language other than English. Chinese (Chinese, Mandarin, Cantonese) – 3365 South Asian (Punjabi, Hindi, Urdu) – 1470 Vietnamese – 373 Philippino (Tagalog, Pilipino) – 323 Spanish – 291 Persian -284 Korean –239 Other – 1182 Native English speakers n = 37 612; any student who never received ESL service and claimed only English as a language spoken at home. 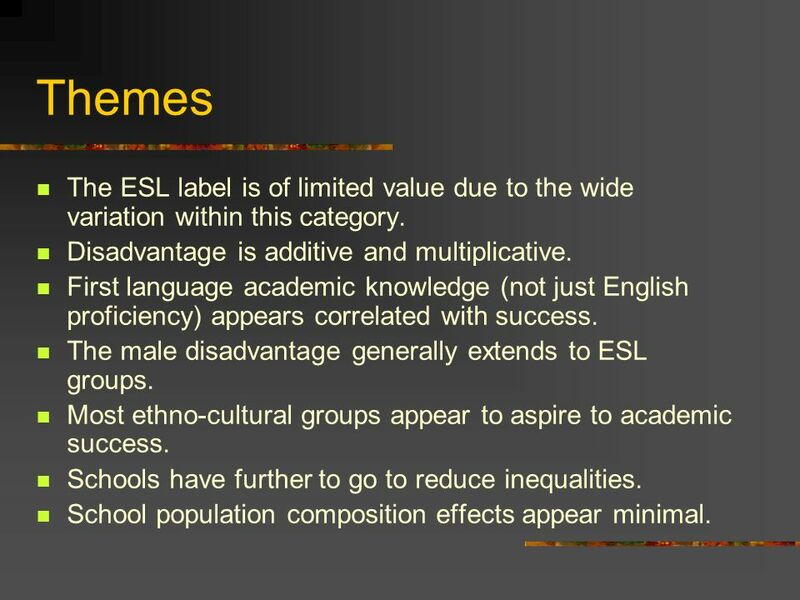 10 Themes The ESL label is of limited value due to the wide variation within this category. Disadvantage is additive and multiplicative. 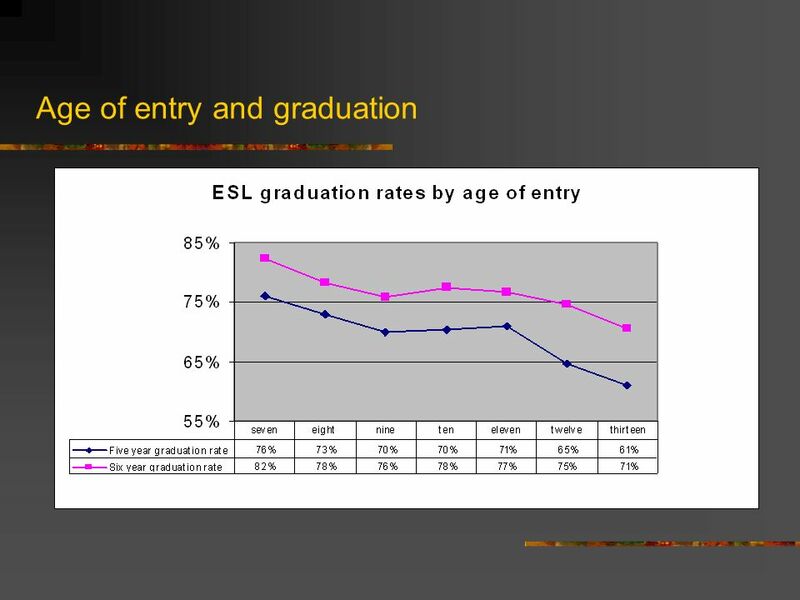 First language academic knowledge (not just English proficiency) appears correlated with success. The male disadvantage generally extends to ESL groups. 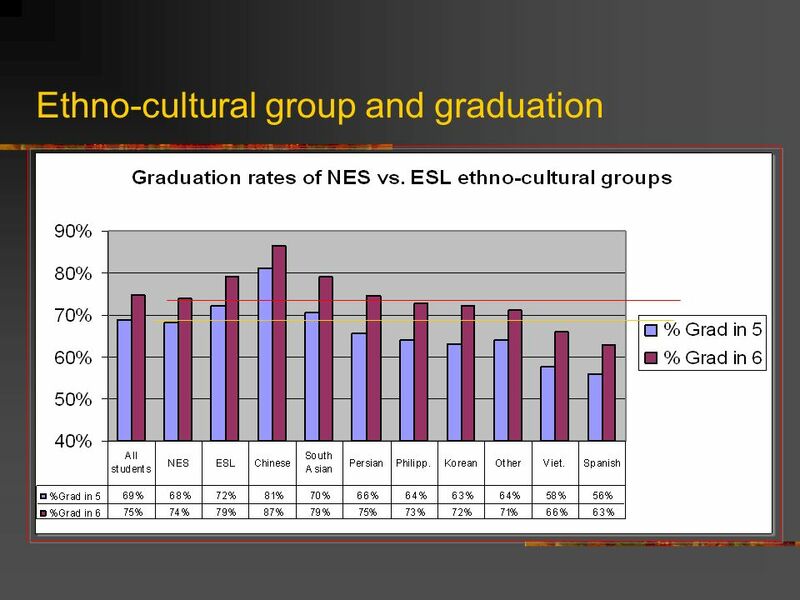 Most ethno-cultural groups appear to aspire to academic success. Schools have further to go to reduce inequalities. School population composition effects appear minimal. 11 Policy implications Disaggregate data for decision making. Assess for prior learning before entry to the system. Target support towards groups most in need. Schools should do what schools do best (i.e. teach language and content). 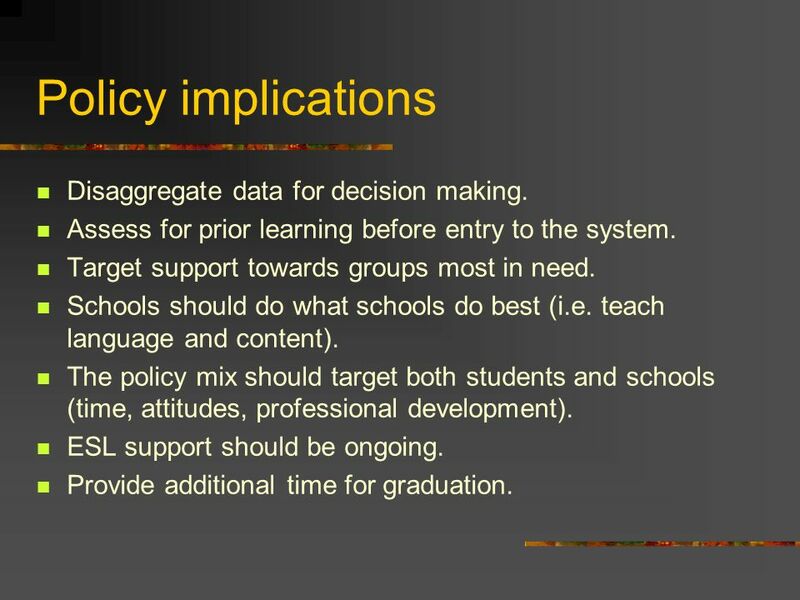 The policy mix should target both students and schools (time, attitudes, professional development). ESL support should be ongoing. Provide additional time for graduation. 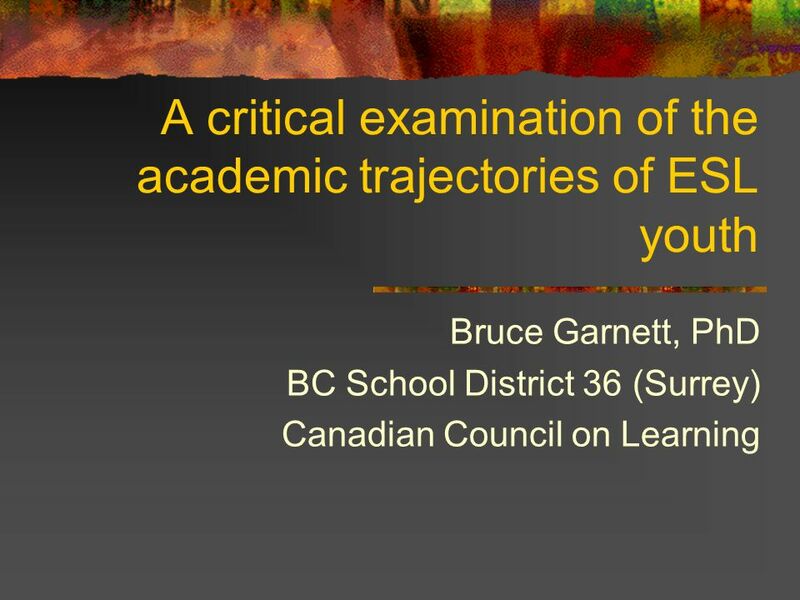 Download ppt "A critical examination of the academic trajectories of ESL youth Bruce Garnett, PhD BC School District 36 (Surrey) Canadian Council on Learning." Improving Practitioner Assessment Participation Decisions for English Language Learners with Disabilities Laurene Christensen, Ph.D. Linda Goldstone, M.S. Language Attributes and Older Adults: Implications for Medicare Policy Ninez Ponce, PhD,MPP 1,2 ; Leighton Ku, PhD 4 ; William. A Look at ESL History of the English language Current users of English What is “English as a Second Language?” ESL in the classroom Misconceptions The.  Residents report using different modes of communication with LEP patients depending on the clinical encounter.  Variation in professional interpreter. Note: this PowerPoint presentation is copyrighted by the Center for Applied Linguistics, 2006. Acculturation and the Health and Well-Being of U.S. 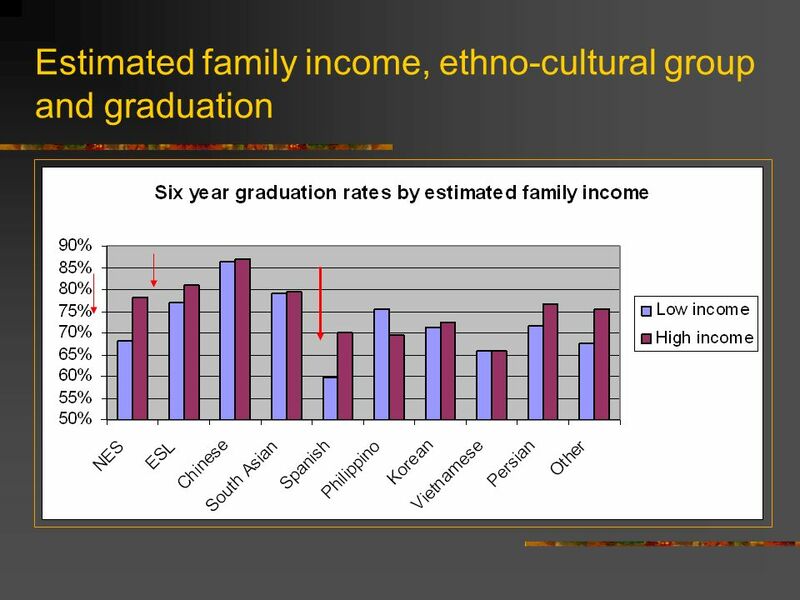 Immigrant Adolescents Yu SM, ScD, MPH Huang ZJ, MB, PhD, MPH Schwalberg R, MPH Overpeck MD, DrPH Kogan. Annual Measurable Achievement Outcomes. 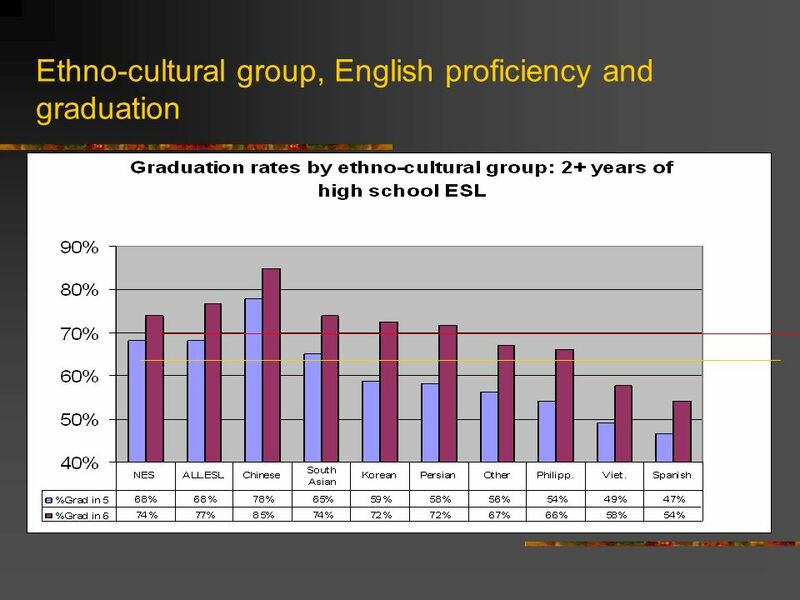 District ELL Demographics January 9, 2015 (2 nd Friday count) Total Enrollment (EP 1-5): 1081 = 13% Total Enrollment. Dual Language Programs Defining Terms Defining Options Defining Results. STARTALK & Heritage Languages in the United States 2010 ACTFL Shuhan Wang, PhD Co-Principal Investigator, STARTALK November 20, 2010. IDENTIFICATION 1 PROPOSED REGULATORY CHANGECOMMENTS Implement a four step ELL identification process to ensure holistic and individualized decisions can. Anne Pauwels Heritage and Community Languages in higher education: Some Initiatives from Australia. English-Language Development Domain California Preschool Learning Foundations Volume 1 Published by the California Department of Education (2008) English-Language. Miami-Dade County Public Schools Division of Bilingual Education and World Languages Dr. Joanne H. Urrutia Council of the Great City Schools BIRE Conference. Culture in TESOL: To Teach or Not to Teach Brian J. English Ph.D. Issues in TESOL TESOL-MALL Graduate Program Woosong University Spring 2005.